posted in GARDEN on January 18, 2015 by Luna. Hot or cold, Tea is a delightful and healthy drink. Whether you’re a fan of the green tea, black tea or even white tea, there are so many documented health benefits. 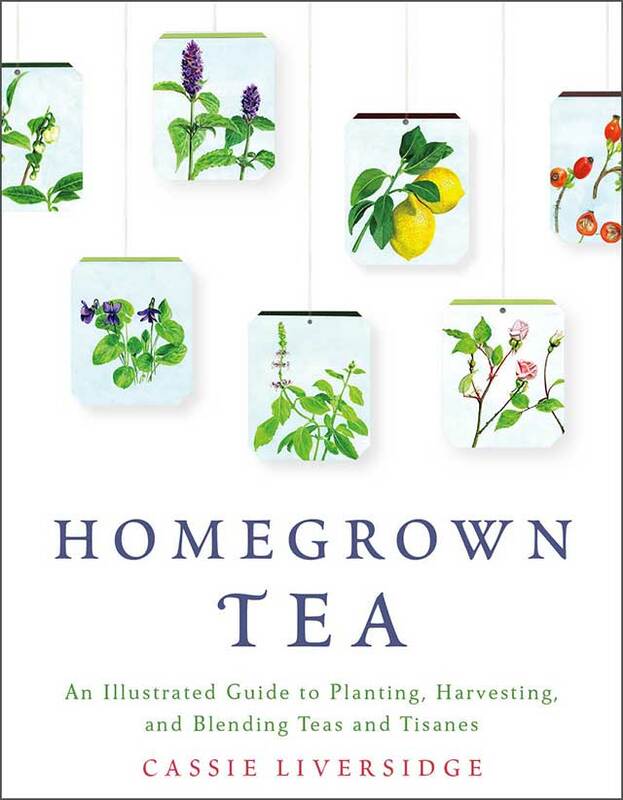 So when we saw this wonderful book Homegrown Tea which walks us through on how to plant, harvest and blend we thought it would be a perfect addition to our library. From Amazon.com you can see the following write-up. Homegrown Tea explains how to grow a large variety of plants in your own garden, on a balcony or even on a window sill could become your tea cupboard. It shows you how to grow your tea from seeds, cuttings, or small plants, as well as which parts of the plant are used to make tea. Liversidge lays out when and how to harvest your plants, as well as information on how to prepare the plant, including how to dry tea leaves to make tea you can store to last you throughout the year. As a guide to using tea to make you feel better, there are nutritional and medicinal benefits. Finally, there is an illustrated guide to show how to make up fresh and dried teabags and how to serve a delicious homegrown tea. It is sustainable way to look at a beverage, which is steeped in history and tradition. We also found a really nice write-up on mother nature network so make sure to head over there. posted in GARDEN and tagged how to grow herbs, indoor herb garden, planting herbs on January 12, 2015 by Jaime. I really want fresh herbs in my kitchen but I’d also really like to just pay someone to come set it all up for me. What can I say? I’m just not a green thumbed girl. The idea seems so overwhelming but when I found these cute setups from The Garden Glove, I thought “Yes”! I can do this AND make it look cute? Here are several ideas for growing indoor herbs and pretty much everything you need to know about how and when to plant them from seed to plate (visual.ly). posted in GARDEN and tagged grow tulips indoors, how to grow, indoor plants, indoor tulips on January 10, 2015 by Jaime. Ummm…what?!!! I have so many thoughts about this, I don’t even know where to begin. I can’t even get them to make sense in my head so that I can put them on paper. There are a few things cheaper in Germany (and most of Europe) than in America. 1) Fresh baked bread 2) Wine/Beer 3) Gelato is only 1 Euro per scoop and 4) Fresh flowers. Fresh Flowers!!! WHY are they so expensive here?! There are FIELDS of fresh flowers growing on the side of the roads in Germany with a sign and a can to put your money in. You picked your own flowers and put your money in the can. It’s based on the honor system and we LOVED it! When I left Germany, I had to give away 3 orchids, 2 lavender plants, a jasmine bush, a small lemon tree, and a couple of unidentifiable houseplants that were impossible to kill despite my lack of a green thumb. I’ve been living in our new (rented) house in Florida for 2 months now and I have yet to buy any flowers or plants. Just one orchid is $20!!! Anyway, my love for tulips is deep. Like as deep as it is for peonies and hydrangeas. But I don’t see them everywhere here like I did in Germany. I don’t even know if they can survive in this Florida weather. THIS could be the answer to all my problems…well, maybe not ALL my problems…but it will make this girl smile every morning. posted in GARDEN and tagged diy garden, easy garden, grow your garden, strawberry on January 2, 2015 by planted. Luna was visiting me in Tampa over the holiday and I was able to take her and her family to one of the local strawberry farms for the best strawberry shortcake of her life (plug for Goodson’s Farm in Wimauma, FL here). Coming from Chicago, she couldn’t believe that it’s strawberry season in December. In between bites of sweet strawberries, cake, vanilla ice cream and whipped cream, we started talking about how are these berries soooo delicious…do they use pesticides on them…what’s the best way to keep these strawberries tasting their best…how long will they last if we don’t refrigerate them? I mean, let’s be honest, we really didn’t need to worry about that last question because between 4 kids, those berries didn’t last two days. Planting my own berries wasn’t ever on my radar in Germany because I didn’t own the piece of grass out my back door. But here in Florida, I feel like I could do it. How and where do I start? Here’s a perfect way to help anybody start their own garden. If you have been holding off, then hold off no more (unless you live in Chicago and it’s too cold to start :)). Be sure to check out the good to be home blog for info about this post.